It seems that a rusty gate got opened by a mischievously alluring shadow who invites listener to play some games in its manor on "Fallen Lucifers", the opening track by which Glue, a brilliant Berlin-based trio comprising of British trumpeter Tom Arthurs - I previously met his name as a member of Julia Huelsmann quartet -, Canadian rising star Miles Perkin - a real talent on upright and acoustic bass of Montreal music scene - and Greek drummer and percussionist Yorgos Dimitriadis, ignites this chat with The Real McCoy. The eight funny improvisations by these musicians aggregate free-jazz modus operandi and bizarre performative techniques to dark-tinged jazz so that you could have the impression that they sometimes dissolved sonorities a-la Kilimanjaro Dark Jazz Ensmble in highly-corrosive acid which managed to break subatomic bonds as well as hierarchical connection as there'a no leading instrument in each track: a seducing trumpet sounds like searching its leak in a funnel which got obstructed by popping drums on "Washington Mint and Blushing Cherry" before the title-track "Chats With The Real McCoy" got the meaning out the name of the band as the trumpet seems to get played as if someone sticked Arthurs' lips by some glue before he managed to articulate some proper tone and a temporary atrophy seems to increase friction for drums and upright bass before they begin to tune in. The lively instrumental scolding on "The Wrong Food Buy" and the shimmering nuance of "She is The Queenly Pearl" precede the funny tightrope walking of "The Tragic Jester" - in order to highlight the portray of such an imaginative character, drums sound like proper eyesores! -, the strangled sonorities of "Split Ink" and the entrancing final "Red Dawn and Blue Denim", where they reaches the highest peak of the release. As they pointed out on the cover notes, it' "best heard with headphones or in an undistracted listening environment". This album is a reissue from a CDr from Rutger Zuydervelt, known as Machinefabriek, and Dag Rosenqvist that sounds as an experiments of contemplative and evocative music that sounds unfinished but, so, incredibly honest and childish in his developments. 'Frost / Vries' opens slowly this release with static layers of drones evoking a snow that falls with the brightness of the light reflections. 'GrÃ¤s Som Bryts Och GÃ¥r Av / Gras Dat Knakt En Breekt' starts an exercise on isolationism and ends as a quiet ambient track. 'BlÃ¥sa RÃ¶k / Rook Blazen' is based upon a guitar lines upon a soundscape and a distant drum that evolves in a static drone and ends with an old recording sample that ends with a stylus fault. 'Ljus I November / Licht In November' starts as the noisier track of this album as it's focused on the guitar distortions but ends as the most ethereal one as the child's field recordings and the piano creates a romantic atmosphere. 'Tappad Vante / Verloren Want' sounds as an introduction to 'Islossning / Ijsbreken' that closes the original release with layers of drones carefully constructed to quietly close the release. 'FeberdrÃ¶m / Koortsdroom' is a bonus track from another CDr and is based on resonances and filters to create a meditative atmosphere. This release could not be as remarkable as the latest releases from Machinefabriek but it's so emotive and appealing that sounds as a christmas' gift to his fans. A nice release. This new release from Cold Spring is debut from a duo that is presented as band presenting 'an intense wall of sound' and is touring with Godflesh. So the noisy soundscape of 'Copper Lock Hell' opens this release as an introduction to '14 Daggers' whose cello introduces the listener to a slowly developing juxtaposition of heavy guitar upon a distant voice. The oriental flute of 'Hypocrisy Banality Possession' acts as a chill out moment before returning to the heavy mass of guitar lines. 'Amoral Apathy Suppression' is even heavier in his searching for a deep guitar drone made out from a drop guitar tuning. The first part of 'In The Nest Of The Red Throat' is interesting as it drops the low frequencies guitar drone that reappears after three minutes hiding the drum part. 'Drain' features the most experimental moments of this release while 'Pacify' closes this release with his slowly guitar lines as '14 Daggers (Kevin Laska Remix)' is a remix trying to enlighten the moments buried in the mix. This release seems too close to his models (Sunn O))) and Godflesh) as the mixing is perhaps too focused on the guitar and takes all other elements in the background but it seems as has some ideas how to evolve this model. Waiting for the next release. The cover art of Crickets Were The Compass depicts beautifully in ink and watercolour a grainy, post-apocalyptic landscape strewn with grim, colourless debris. A solitary dog stands in the foreground, dolefully glancing about; after an unspecified disaster, life has inevitably found a way. As much is reinforced by brief elaborations upon each of the tracks' titles, such as 'It Haunts Her' ("She was scared. The storm outside hammered the walls and lit up the sky. We found solace in sound.") and 'Crickets were the Compass and the World Goes 'Round' ("Directionless I listened for something to guide me. The crickets called from all directions at once. I stood still."). Combined with the album's images and compositions, these brief passages give the impression of survivors or travellers in desolate and unwelcoming places, faced with the numbing challenges of life in the wake of massive and abrupt change. The music itself contributes to this setting in various layered articulations of thick, distorted drones, live instrumentation and gritty textures. The chief (but by no means sole) source of each of these appears to be the guitar. Alongside producing low-end grimness, it also often takes on a cleaner role, with lonesome, aimless picking delaying into the distance on several of the pieces. Analogue synthesisers and unidentifiable samples provide additional texture. A running evocation, sometimes impersonated and sometimes probably directly sampled, is that of radio, now vacant of living broadcasters and transmitting only the stiff indifference of empty frequencies; the sound of the absence of others. As it crawls along, the record's style is definitely consistent and strongly focused on representing its themes. Despite this, each piece has something of its own characteristic arrangement. 'It Haunts Her' opens the album with a buzzing, slow warble rather resembling a siren - drearily and dutifully continuing to sound out long after the dust has settled. 'People Keep Asking And I Say You're Well' begins with radio-like feedback manipulations, gradually accompanied by a slow, shapeless synth motif and introverted guitar twangs. 'There Isn't A Day That Goes By' stands out particularly, portraying a dance of looped quavering feedback and undulations of slow-attack lead noodles. The whole thing rolls about in a murky mid range, but retains a lighter tone than the other pieces. "But there are moments", reads its subtitle. Besides periods such as this, the relentless and discomforting gloom of it all makes for quite a dreary listen. 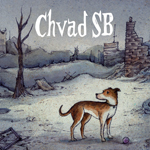 Chvad SB manages well to soundtrack a forlorn, speculative narrative of life after disaster that recalls literature such as McCarthy's The Road. The album's limited source material and resulting sameness of texture hammers home a sense of entrenched desolation and destitution, unlikely any time soon to change significantly. The world painted has lost much of its colour and, in a slightly disconcerting way, has entered its own kind of relaxed state. There is, of course, a suggestion of allegory. "[Of] coming to terms with fond memories", as the press release puts it, "& letting them go."